For this exercise I was to take every opportunity to practise drawing people. Looking at magazines and TV to get the practise that I need. After sitting and studying people in my last research point ‘People Watching‘ I thought I would get out and try and sketch some real live moving people, how hard could it be? My girlfriends son was in Bangkok for the school holidays so we decided to take him to the railway park that I had visited for ‘A Sketchbook Walk‘. After a few laps on the bicycles he was ready for some ice-cream and I was ready for some drawing, so while his mum fed him in a nearby restaurant I sat down on a mound focusing on a part of the path where bicycles weren’t allowed to be pedaled and tried to draw as many people as possible. 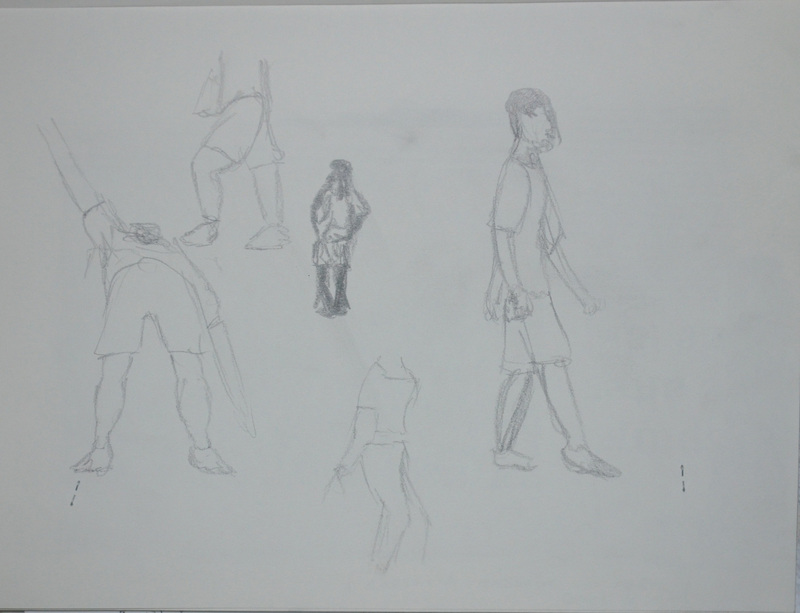 The easiest to draw were the ones doing absolutely nothing of course or standing around stretching. I really struggled with the ones walking around because…they were moving! After ten minutes of being bitten by ants and getting cheesed off with people walking round the back of me to see what I was doing. I decided that it was best to go home and do some practising from the newspaper. 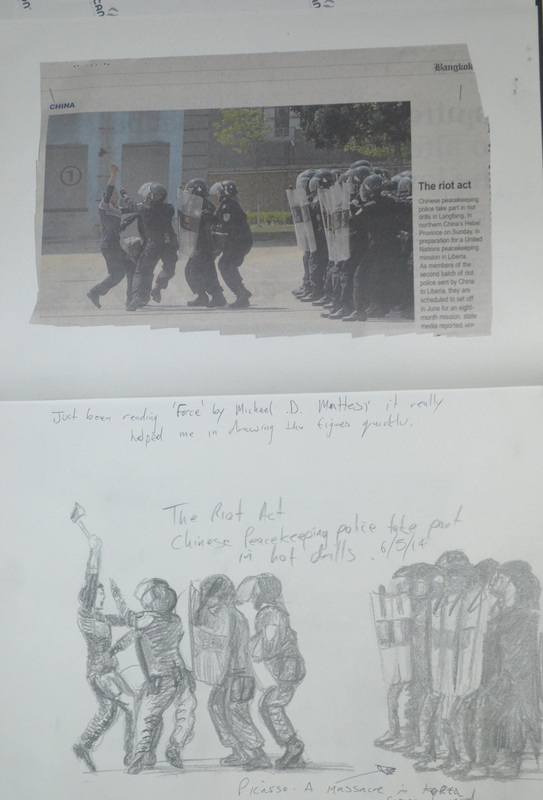 The next day at work I went through a copy of the Bangkok post and cut out what I thought were the best photos I could find for practising drawing the moving figure. 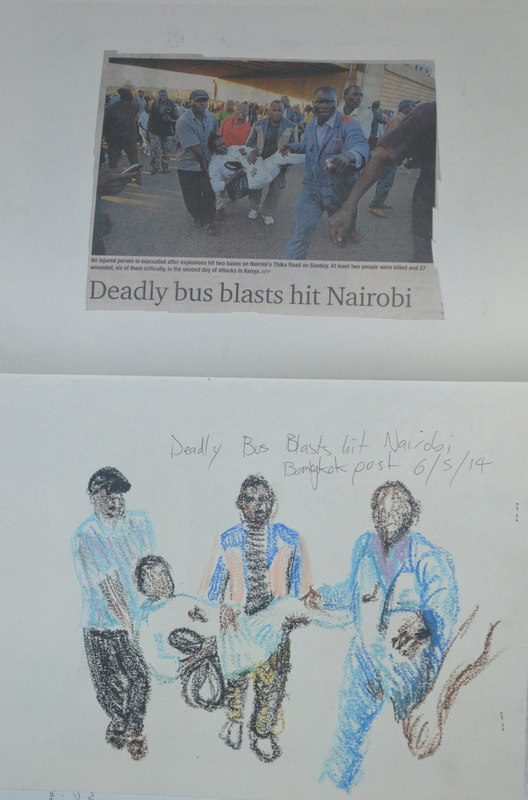 The second scene was a bombing in Nairobi, three rescuers carrying a possible fatality away from the blast. I chose to draw this in oil pastel as fast as possible and I think I did quite well to depict movement in the very rough sketch. 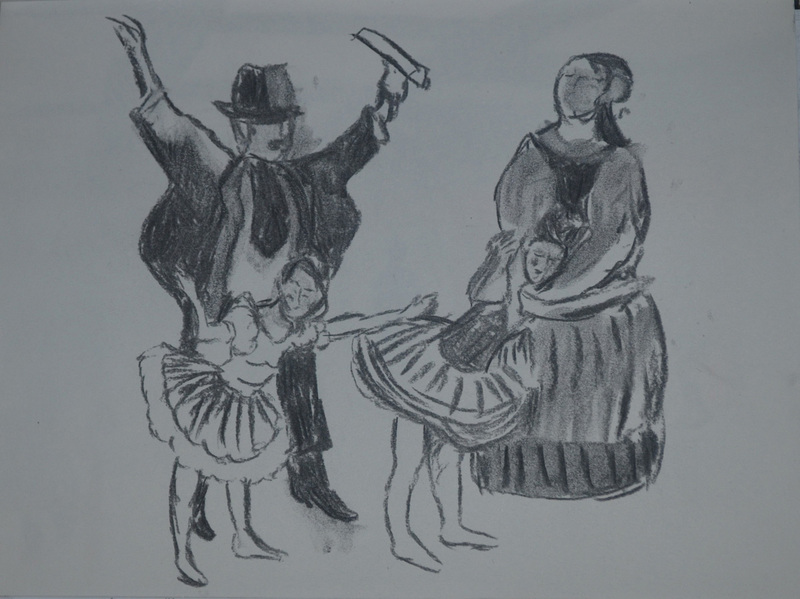 The next drawing was about the Nutcracker ballet in Bangkok I chose charcoal but I reckon with a more appropriate medium I could have done a lot better. 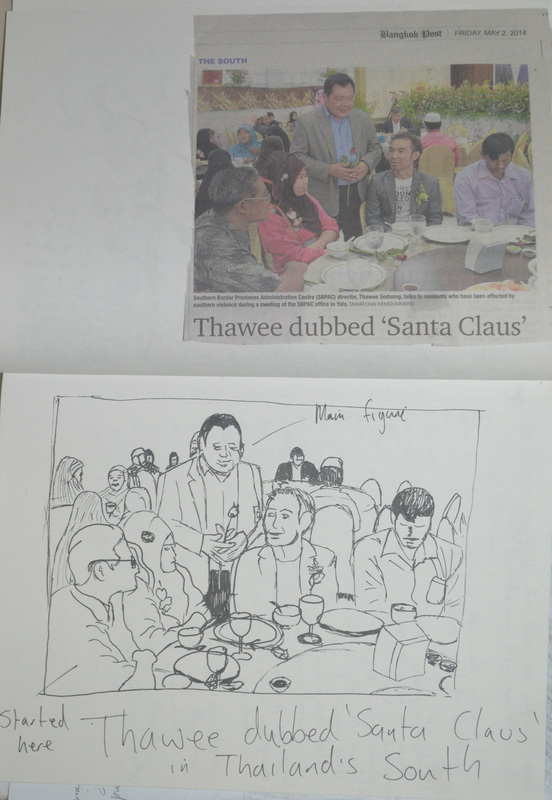 The next drawing was from a news article about some politician being nicknamed Santa Claus in Thailand’s troubled south. I built up the scene from the guy in the bottom right hand corner and worked my way around the table, from there I drew in the main character, hence not in proportion and then went onto draw the background. 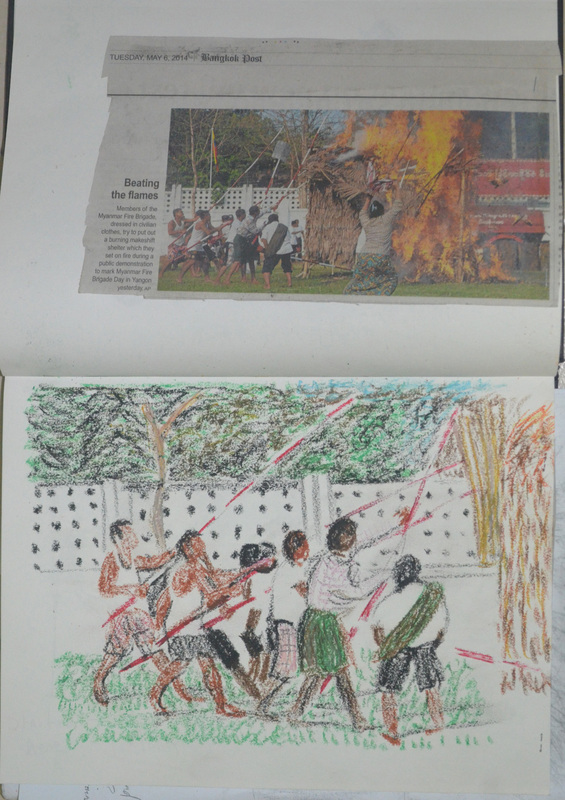 The next newspaper article was about the Burmese fire brigade dressed up as civilians for some demonstration or other. I worked very quickly in oil pastel again with this one and then went onto draw in the background. In Thailand, Tesco is known as Tesco Lotus, Lotus being the Thai partner and the supermarket is usually always in a shopping mall. On Sunday I work at the language centre on the 4th floor. 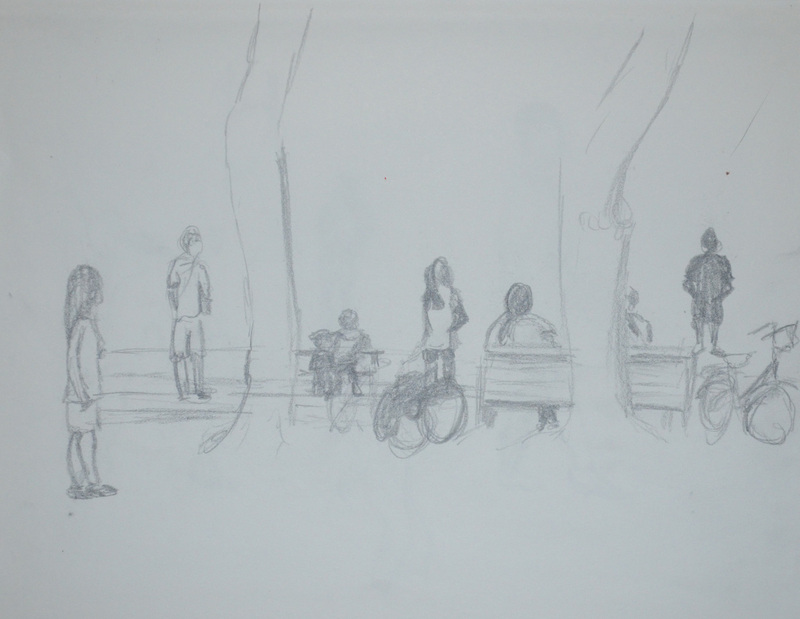 Last week my first afternoon student cancelled so I decided to sit outside for two hours and draw the passers-by. 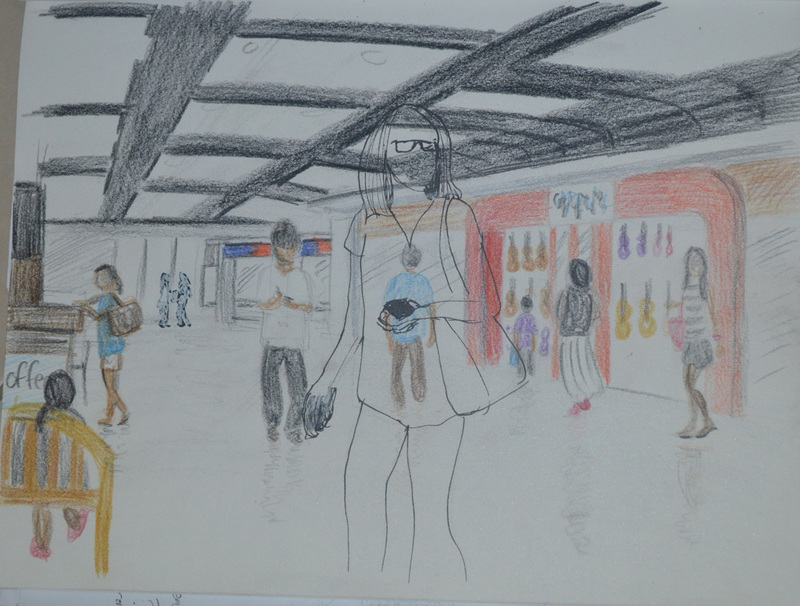 It took me about twenty minutes to draw the shop fronts inside the mall across from the language centre then in colour pencil I began to sketch people as they walked past, a lot of the time having to remember how they were stood seconds before as I couldn’t draw them fast enough. I tried drawing in both colour pencil and pen this worked well superimposing the shape of one of the Thai teachers over the top of the other people. But then I made the mistake of drawing two people in the very background in pen, as they should have looked more faded than the others so I went over them in a white pen to fade them out a bit. The worse mistake I made here was trying to draw the ceiling in afterwards which was a network of suspended panels ,lights and pipes.